And there’s another factor. Almost everyone is already thinking about the 2020 Olympics in Tokyo and using this event as a trial run. It wasn’t a lost day. Ledecky took the 800 in 8:09.13 — the fifth fastest on record — and will be the favorite in the 400 during the four-day event in Tokyo, the biggest meet of the year for most swimmers around the Pacific Rim. American teammate Lilly King did her thing. 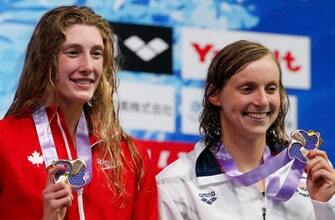 The Olympic champion in Rio again won the 100 breaststroke, this time in 1:05.44. Not her best time, but she’ll take it. King hasn’t lost this race since 2015. Host nation Japan won twice. Yasuhiro Koseki took the men’s 100 breaststroke, and Yui Ohashi won the women’s 400 individual medley. Australia’s sole victory was in the mixed medley relay. China has sent fewer swimmers and is focusing instead on the Asian Games later this month in Jakarta, Indonesia. Other American winners included Jordan Wilimovsky in the 1,500, Townley Hass in the 200 freestyle, and Chase Kalisz in the men’s 400 individual medley. He beat out Olympic champion Kosuke Hagino and Rio bronze medalist Daiya Seto. Kalisz took silver in Rio.